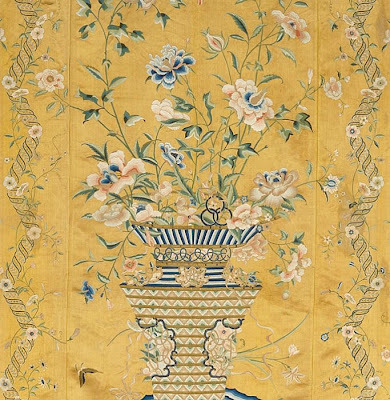 Coverlet, Chinese, for the European market, 17th century; silk satin, embroidered with silk and gilt-paper-wrapped thread; 84 x 79 in. Detail. See the entire work here in high resolution. All images in this post are from the museum's website. 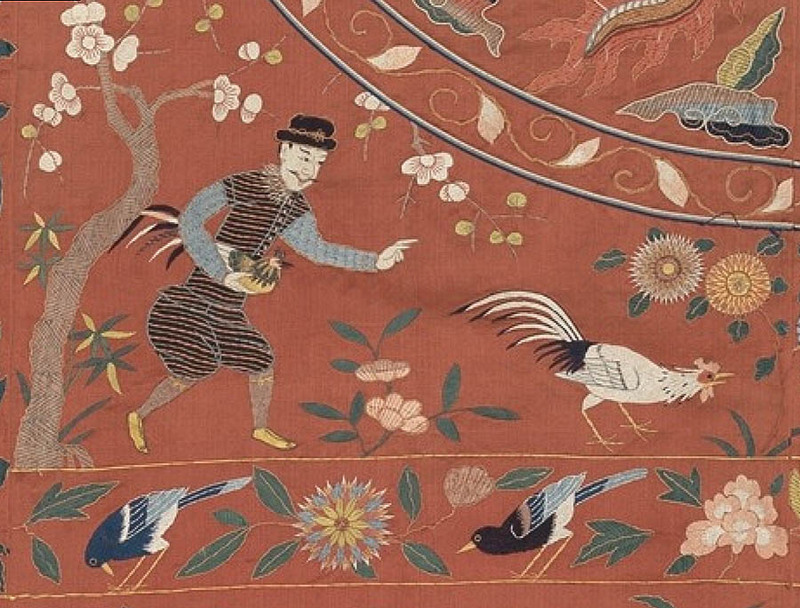 If you are interested in textiles, in the history of trade, or in aesthetic qualities such as pattern, color, inventive design, and craftsmanship, the current show at the Metropolitan Museum of Art Interwoven Globe: The Worldwide Textile Trade, 1500-1800 is a treasure trove to be explored. At the link, the Met has generously provided a website where you can browse the entire show and see most of the objects in high resolution. I was delighted by the show, by the intricacy and quality of the work, by the charm and beauty in the smallest details. Although I saw the show through a mainly aesthetic lens, the aim of the curators was to show how design ideas traveled across continents, with East and West influencing each other in their trade goods. 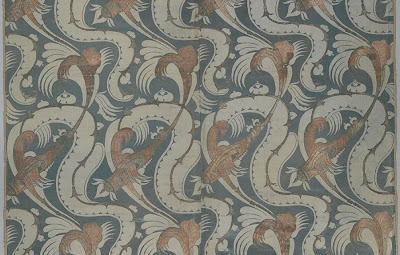 For instance, in this coverlet, the central motif (which you can see at the link above) is a traditional Chinese one of two dragons. But the details of hunters, such as one I've included above, show them dressed in European clothing. 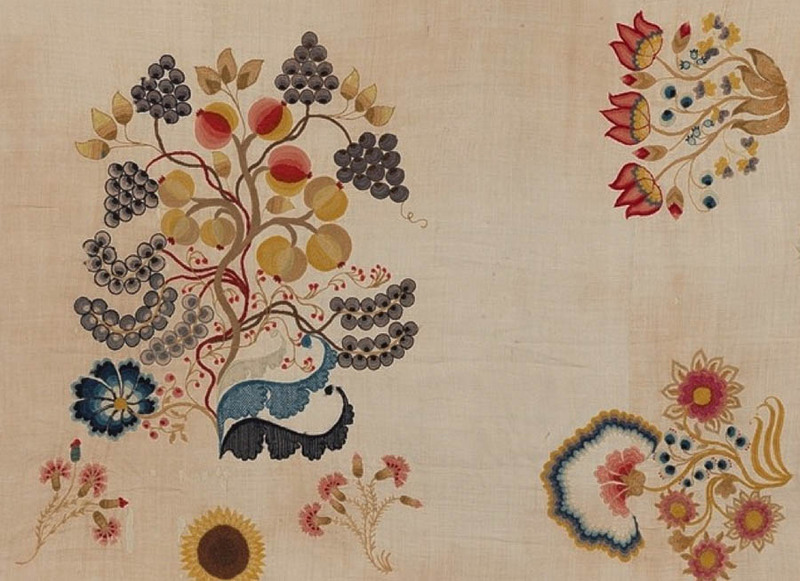 The delicacy and refinement of the embroidered animals and flowers are stunning. 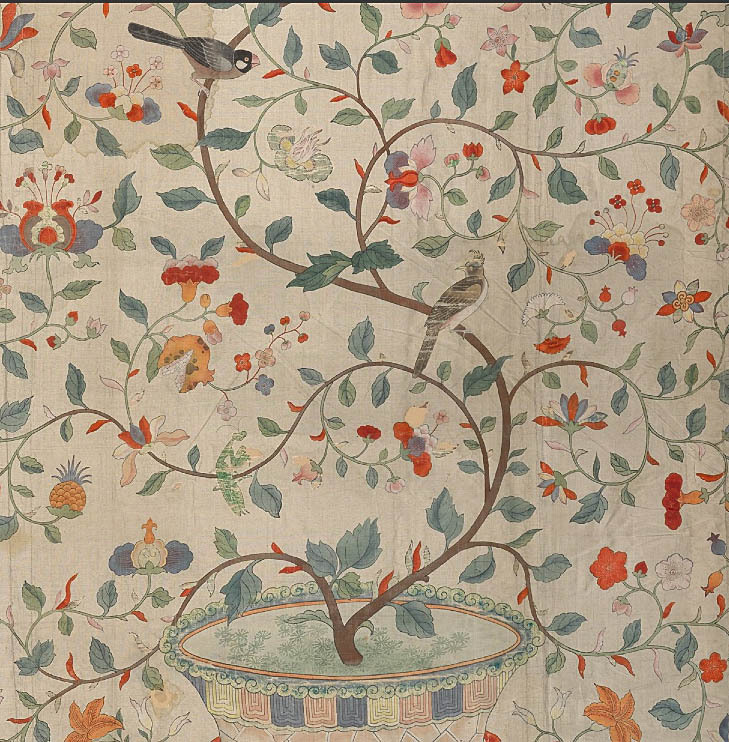 The borders of the coverlet (see the hi res version) are gorgeously imagined, with flowing lines of feathers and stems. Hanging with Triumphal Arch, India for the Portuguese market, 17th century; silk satin embroidered with silk, 105.1 x 83.1 in. Detail. See the entire work here in high resolution. 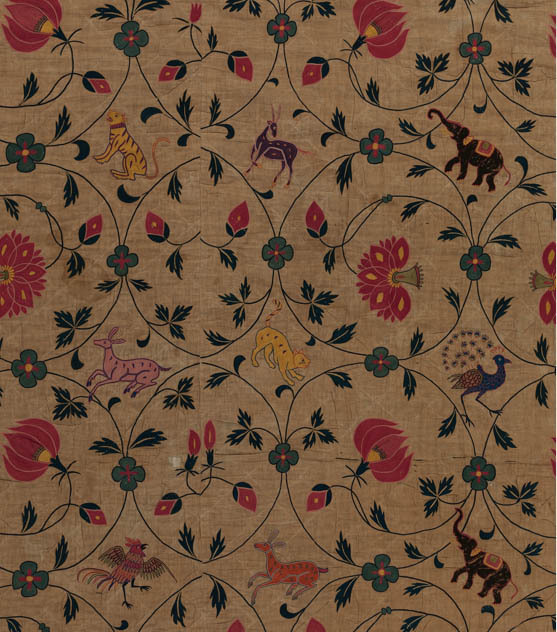 This Indian textile is very different in its monochromatic style, but similar in its flowing and fanciful border of flowers and animals. The central image is of a triumphal arch built for the entry of Spain's Philip II's entry into Lisbon. 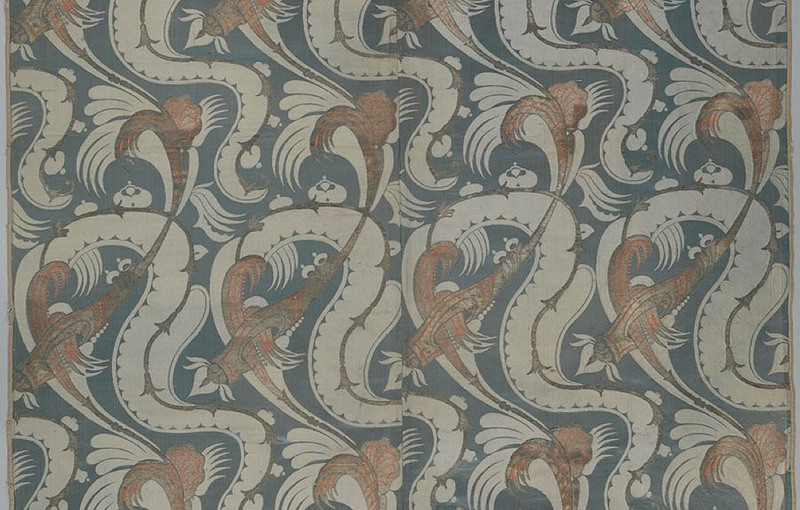 The Indian makers of this textile copied the design from a Portuguese book of 1622. See the entire work here in high resolution. At the center of this remarkably detailed quilt is a three-masted sailing ship, a celebration of Europe's mastery of the oceans. 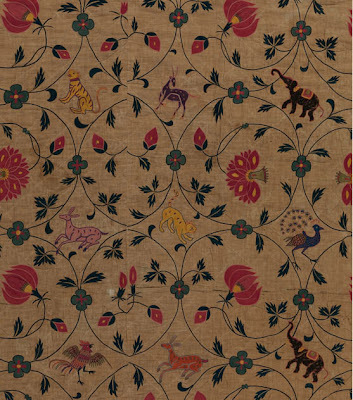 From the Met's website I learned that this piece is similar to Bengali bedcovers, so illustrates that there was a fertilization of ideas back and forth, East to West. I couldn't help thinking, as I viewed this show, that our current outsourcing of manufacturing, especially of textiles, is nothing new; it has been going on for hundreds of years. 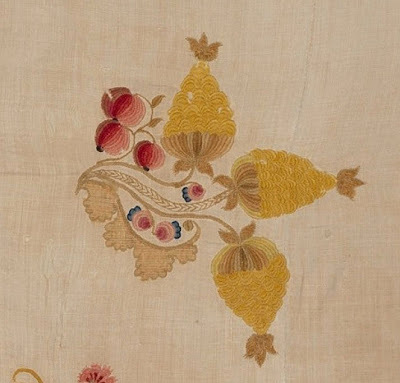 Length of "Bizarre" Silk, France or Italy, 1700-1710; silk satin, brocaded, silk and metal-wrapped thread; 97 x 43 in. Detail. See the entire work here in high resolution. Doesn't this piece of fabric look contemporary? maybe early 20th century or Art Deco? but no, these "bizarre" silks were produced in the early 18th century and their designs were influenced by Middle Eastern patterns. A surprising and amazing piece. 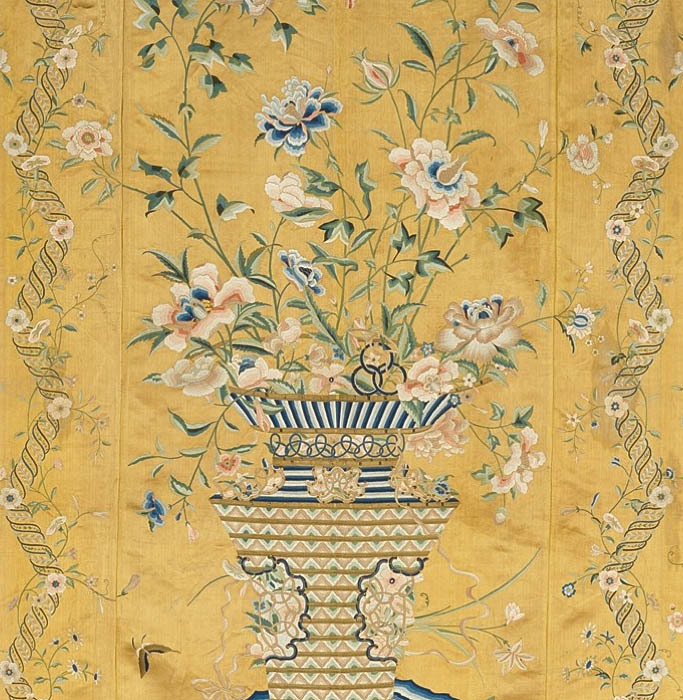 Double-sided Hanging, China for the European market, second half of 18th cent; silk satin embroidered with silk, 95 1/4 x 87 1/4 in. Detail. See the entire work here in high resolution. 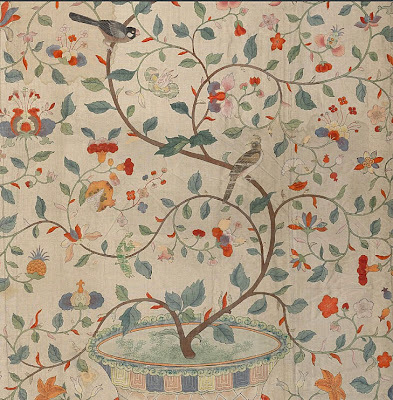 This hanging is a sumptuous object, its silk glittering, its embroidery incredibly fine....and it was as beautiful on its other side, on red silk instead of yellow. (See the second side at the link above.) When I looked at works in the show with incredibly elaborate and refined embroidery, I wondered about the making of them: did several women (and it was most likely women who made them) work on a single piece or was it several at once? were they made in the home or in a "manufacturing" center? how long did it take to produce something like this? There are no answers to questions like these from the exhibition wall labels; maybe we have no answers so many hundreds of years later as to the social culture around the making of these luxury goods. One of my sisters, who has worked in the textile industry, was disappointed in the exhibition because there were no explanations of techniques used. The curators were focused on their ideas about cross-fertilization of design ideas and didn't give us much other information. For me, though, the joy of the show was in the beauty of so many of the objects on display. The flowing lines of vine, the exotic animals and flowers, are a pleasure to see. Wall Panel with Garden Urns, China, for European market, late 18th century; silk taffeta, painted and printed, 78 x 43 in. Detail. See the entire work here in high resolution. 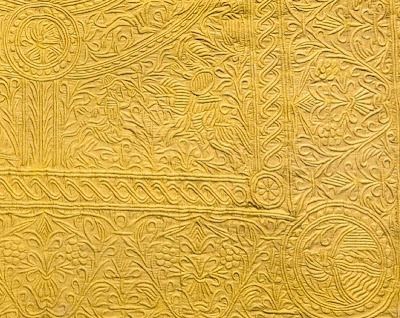 In these decorative patterns there's a sense of the sheer love of creation, an attention to details of nature that celebrate life. A panel like this would have graced a "Chinese room" in a European country house. How wonderful it must have been to be surrounded by these images. 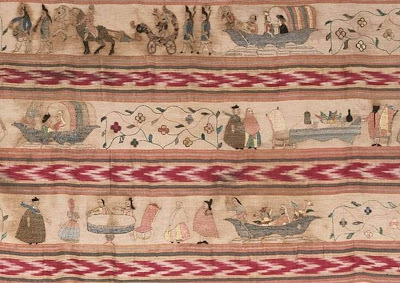 Shawl (Rebozo), Mexico, late 18th cent; silk embroidered with cotton, silk, and metal-wrapped thread; 30.5 x 93.7 in. Detail. See the entire work here in high resolution. 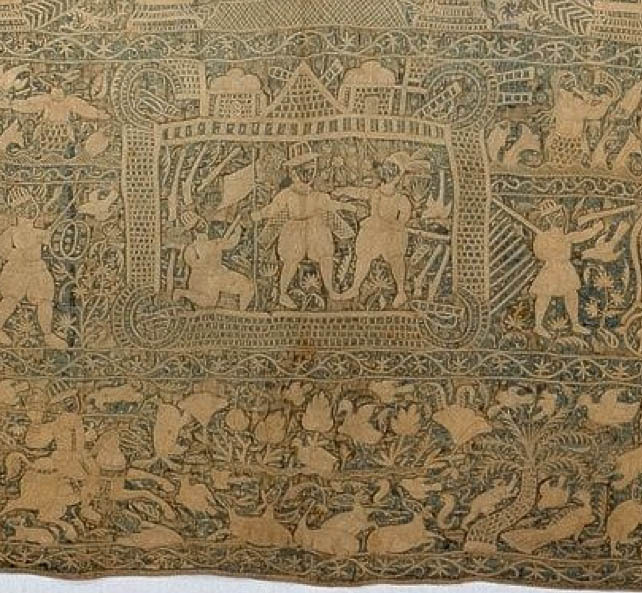 There were also textiles from North America in the show. 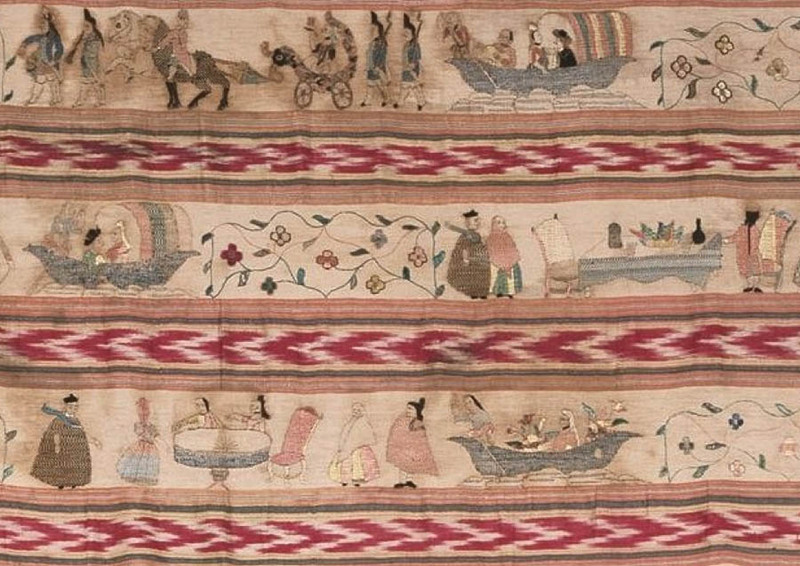 This Mexican shawl has charming depictions of people strolling, riding, and boating in a Mexico City park, Xochimilco. European influence intrudes in the depiction of a table and chairs, in the clothing, and in the Jesuit priest seen again and again among the figures. 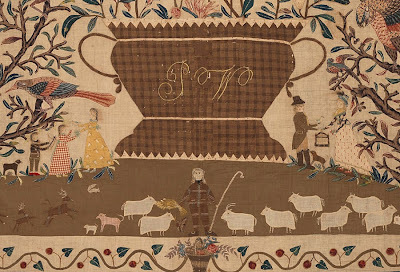 Coverlet, Ruth Culver Coleman (died 1801), United States, Sag Harbor, NY; linen and wool, embroidered; 80 3/4 x 95 5/8 in. Detail. See the entire work here in high resolution, along with many detail images. It was wonderful to see a couple of American works whose maker is known or surmised. 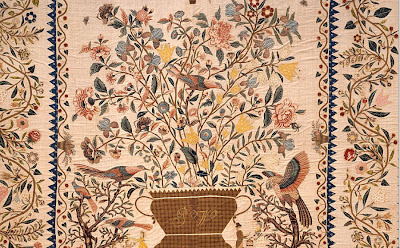 So here I know that one woman made this exceptional coverlet, gorgeously embroidered. She must have made it in her home on eastern Long Island, inspired by designs she'd seen on imported printed cottons. According to the museum website, the blue flowers along the border, with multiple flowers from a single stem, came from Iranian and Turkish textile design. Coleman was probably unaware of the origins of her patterns. 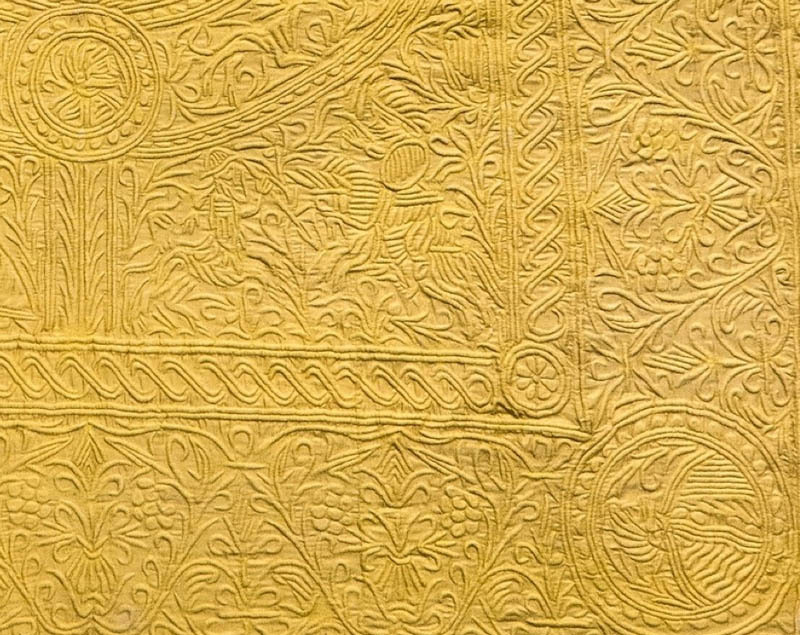 This third image from the Coleman coverlet gives you a better idea of the embroidery technique that she used. If you click to enlarge the image, you can see the stitches more clearly. This detail is quite marvelous. Coverlet, probably Sarah Furman Warner Williams (born 1764), United States, New York, New York; linen and cotton, 103 1/4 x 90 1/2 in. Detail. See the entire work here in high resolution. 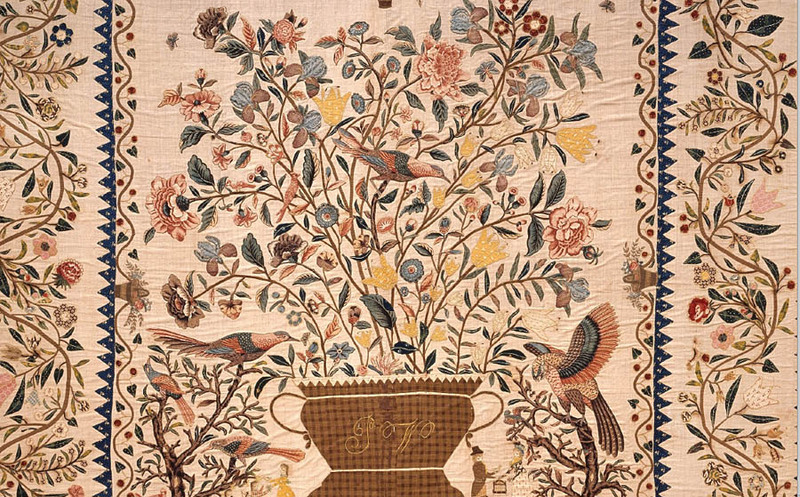 Another marvel by a named maker is this complex appliquéd coverlet by Sarah Williams of New York City. It was made as a wedding present and has a version of the Indian Tree of Life at its center. 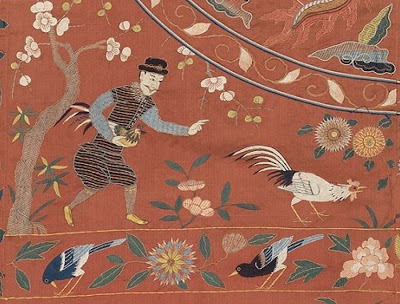 Along with the exotic birds and flowers is a sweet depiction of a shepherd with his flock, children at play, and a man offering a bird and cage to a woman. So much of the pleasure of seeing these works is in their physical presence, the sense of the hand at work, the evidence of the care and precision of that hand. Which is to say that a photograph gives only a pale idea of the excitement I felt at this show, but it will have to suffice. what a marvellous morning I've just had thanks to you Altoon. 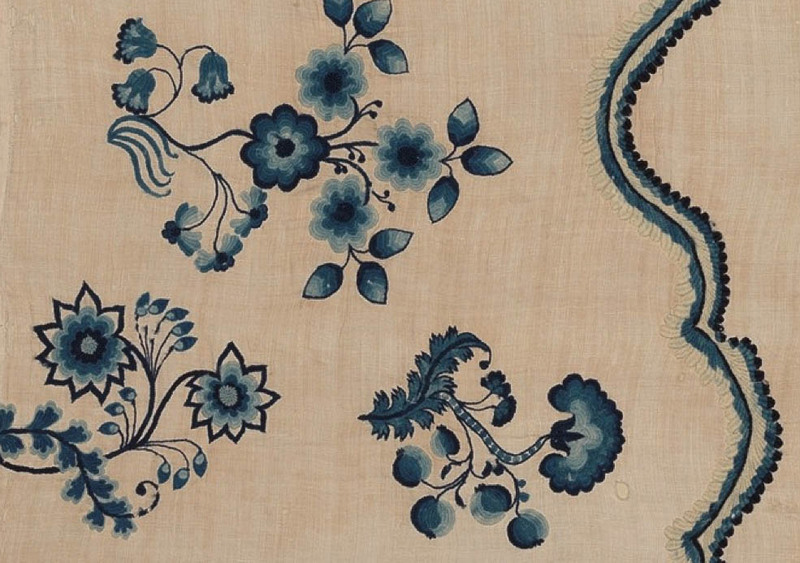 Textiles are a great interest of mine and this post and the links to the exhibition at the Met were a delight. In grey London I have spent a pleasurable hour or so at the Metropolitan Museum in New York. and then I read several of your archive posts which were equally stimulating. I enjoyed your 2011 restrospective post and liked following the path of your work from graduate school to the posting date. there are plenty of resonances in your work now from those times and I like seeing it. the post about style and the song of an artist and perhaps being hard wired in some way was equally exciting and scary - the positives a plus but the negatives, often only seen by oneself, a little scary. but challenging too to think about accommodating them. someone once said give me the grace to accept the things I cannot change. Kahil Gibran I think. time for lunch and I read your post about eggplant sandwiches - my husband and family are Iraqi Jews who fled the country in 1960 - those same sandwiches are a firm favourite in our house and I keep the oil in a jar and often put any leftover eggplants (aubergines here) in the fridge to add to sandwiches of any sort over the course of a few days. thank you so much for sharing all of this. I have often read and looked without commenting but I just had to let you know what a wonderful few hours you have given me today. Thank you so much, Maureen, for your generous comment. I'm so pleased that you enjoyed this post, and others too. And how wonderful that your family and mine share a common culture.